See scan - perfect condition. This is a nice and scarce US / USA American NAVY / Naval marine WWI victory medal to celebrate the Armistice signed on November 11th 1918 by the Allies. The medal was most likely issued by the American NAVY and Marine forces that were in Japan during that time still helping the Japanese people for to overcome the disaster of the great earthquake that destroyed Yokohama during September 1918. 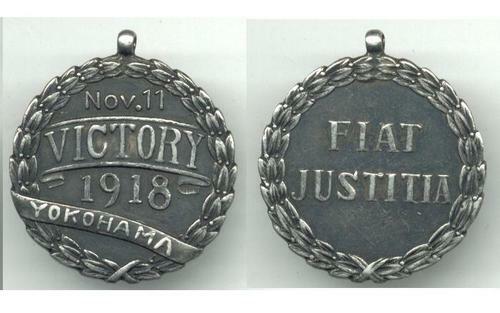 This is the reason the medal also has the name Yokohama waiving as a flag underneath the Victory slogan. There is a latin text at the reverse surrounded by a wreath saying FIAT JUSTITIA i.e. fiat justitia ruat caelum : Let justice be done though the heavens should fail and being one of the motos of the US NAVY. Absolutely scarce militaria / military collector piece and one of the rarest and strangest WWI Victory medals I've seen.